I still remember the day my mom brought home a box of premixed sauce for tofu. I must have been around 9 because I remember cooking this dish. Mind you, almost the entire box, instructions and all were written in Japanese. The only things I could understand were the “how-to” illustrations and the words “Cook Do” on the front of the box. I made this dish, I fried the pork until it was cooked all the way through, and I added the packet of sauce and tofu to the pork and let it simmer. And boy was it delicious! I had no idea that the proper name for the dish was Mapo Tofu so from that day, I called it Cook Do and I remember eating Cook Do regularly until I moved in with my future husband who did almost all of the cooking until our son was born. These days, I make Mapo from scratch. It’s easy enough, and I almost always have the ingredients on hand. Plus, it’s become comfort food for my family. My son spent an entire month in New York with his grandmother last summer. When I flew over to pick him up, one of the first things he asked was if I would cook Mapo Tofu for him. Before that moment, I never thought that the foods I cooked for my children would become something they would want to come home to. Heat the oil over medium high heat in a wok or frying pan. Add the garlic, and ginger and cook until fragrant (less than 30 seconds). Be sure not to brown the garlic and ginger. Add the ground pork and stir fry until the pork is cooked through and is no longer pink. Add half of the spring onions, the three sauces, all of water and tofu. Bring to a boil then reduce heat to low and simmer for 10 minutes. Mix cornstarch and rice wine vinegar, add to pan, raise the heat and bring to a boil stirring gently until the sauce thickens. Add the remaining spring onions to the pan. Serve over hot rice. Enjoy. Notes: Yeo’s hot bean paste is one of the milder pastes we’ve used. Different brands of hot bean paste have varying levels of heat so you may have to adjust your measurements accordingly. 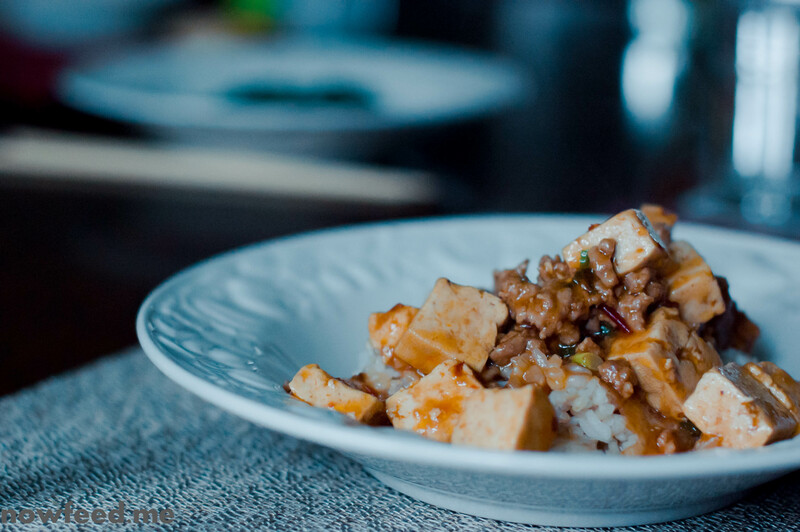 This entry was posted in Food, Recipes and tagged Japanese, Mapo Tofu, pork. Bookmark the permalink.